We’d love your help. Let us know what’s wrong with this preview of Farewell to the Horse by Ulrich Raulff. To ask other readers questions about Farewell to the Horse, please sign up. This book seems like it was a LOT of fun to write. It feels much like a conversation with a really smart and interesting person who knows everything there is to know about horses as they relate to literature and world events and man. And during this long and random conversation, there are points where you sit up and listen because you have never thought about things that way and certainly never thought to consider human history through the horse. But just because it was fun and interesting to wr This book seems like it was a LOT of fun to write. It feels much like a conversation with a really smart and interesting person who knows everything there is to know about horses as they relate to literature and world events and man. And during this long and random conversation, there are points where you sit up and listen because you have never thought about things that way and certainly never thought to consider human history through the horse. I'm not a horsey chap, but there is enough here to keep a history buff's attention. It certainly makes a strong case for the centrality of the horse in the growth of societies, and the impact of that growth on our world today. At points, very informative, interesting and compelling. But elsewhere, it was dull and laborious. A mixed bag not consistent but still worth the effort, although I did skim read through some parts. I've given up on this book. It is well written but the basic premise is wrong. Sure, horses no longer work but, as the author acknowledges, their numbers have increased massively in the last 4 decades as they have found a new role in the sport & leisure world. This is similar to the shipping story - overtaken as a means of transporting people and freight, ship passengers have increased from half a million in the 70s to 25 million now as the cruise market has taken off. I don't see any books I've given up on this book. It is well written but the basic premise is wrong. Sure, horses no longer work but, as the author acknowledges, their numbers have increased massively in the last 4 decades as they have found a new role in the sport & leisure world. This is similar to the shipping story - overtaken as a means of transporting people and freight, ship passengers have increased from half a million in the 70s to 25 million now as the cruise market has taken off. I don't see any books titled 'farewell to the ship'. This cultural history intrigued me. It is in places well written, in places repetitive, in places a vivid expression of the writer's opinions. It is, after all, a cultural study, and any one of us has a set of opinions about our and others' (present and past) cultures. It does hold onto the horse as the central idea around which he explores humans and how we deal with our surroundings and our others. He introduces, frequently throughout this book, very interesting ways of looking at concepts such This cultural history intrigued me. It is in places well written, in places repetitive, in places a vivid expression of the writer's opinions. It is, after all, a cultural study, and any one of us has a set of opinions about our and others' (present and past) cultures. It does hold onto the horse as the central idea around which he explores humans and how we deal with our surroundings and our others. A well-researched and educational read. I enjoyed the breadth of knowledge found in the pages. Unfortunately, the execution of this great history makes it all fall short. Often scattered, often repetitive, and sometimes downright dull with ramblings. I toyed with giving this book four stars. It really did contain a good deal of captivating stories and histories about the horse. But since I had to force myself to keep reading so often throughout, I couldn’t justify more than three. Very much a *cultural* history, really a collection of horse-related facts and thoughts centering on Europe and North America in the "Long Nineteenth Century" (1792-1914). "Farewell" because after that horses became less and less important as historical and economic actors--though they were still much more crucial on the Eastern Front in WW2 as draft animals than I had realized. It gave me a lot to think about, but his Eurocentrism makes the history only a starting point. The book was interesting and a well documented history of the horse. I wanted to like it more, but parts just seemed to ramble and had way too many quotes. It sometimes had the feel of a college paper that needed to make word count. 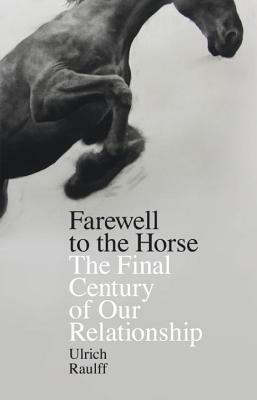 But if you are interested on the impact that the horse has had on culture and history, this is a pretty decent book. So depending on what you are looking for, and your background with horses, you may enjoy it, or you may not. Writing was far too sophisticated for my liking. Too many obscure (to me) phrases from obscure (to me) persons, all in foreign languages. Nor have I developed an appreciation for in-depth analysis of paintings and photographs by which history can be inferred. Hopefully, for the author, others are far more worldly than I.
Raulff's book is filled with tons of facts about horses. I'd never thought about the economy that grew up around supplying cities with oats and hay for their horses. The huge numbers of horses lost during WWI and WWII is also addressed. But despite the interesting details, they are lost in such a dry, dry, dry text. Meditative and incredibly wide ranging but not narrative in a traditional sense. A hard read to digest. Poetic, associative and deeply informative. I checked it out of the library and am considering buying a copy. Rauff did get the color of Tom Mix's horse wrong though -- Tony was a bay. I could not stay awake through this book. I opened it with great anticipation and really loved the idea of the book but it did not hold my attention. I was not able to finish it. There's some really interesting material in here but it's a bit of a slog!